All sponsors will have their logo featured on the BarCamp London website, will be given space to put up publicity at the BarCamp, have the opportunity of handing out schwag in our goody bag, will be mentioned throughout the weekend, and much much more! Sponsors also have priority access to BarCamp tickets. BarCamp – An unconference. Stimulating conversation and discussion about attendees own passions. Who – 300 intelligent, engaged, open thinkers from a wide variety of backgrounds and of every age. A BarCamp is an open, free-to-attend, participatory unconference. Unconferences differ from conferences in that the schedule is created and filled by the attendees, with everyone running a session or talk about whatever subject they have a passion for. From Cocktail Making to Thermodynamics for Beginners, Arduino Hacking to Photography, BarCamps attract people from all sorts of backgrounds from creative to technical, and stimulate discussion, comment and education outside of attendees spheres of experience. To date there have been over 200 BarCamps worldwide since the phenomenon was started in San Francisco in 2006, and they have been attended by many tens of thousands of people. London has been host to 6 BarCamps (and many other more specific camps, such as SocialMediaCamp), and now a group of dedicated, passionate organisers who have been involved in BarCamps across Europe are hoping to host the next BarCamp London are looking for sponsors to make the event a complete success. 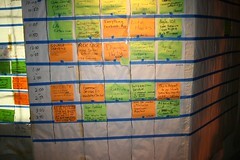 "The Grid" is the unconference way of organising the schedule. Photo Credit: Tara Hunt (via Flickr). BarCamp attendees come from all walks from life and ages 8-80, what they have in common is a passion for stimulating conversations and expanding their own knowledge. They love to give back to the community and a barcamp is the perfect place to do this. Barcamp attendees are not only the great thinkers of today, but the great thinkers of tomorrow. They are excited by the diversity of discussion and the insights that are achieved in the intellectual melting pot that is BarCamp. Barcamp is an excellent opportunity to be involved in innovations that shape the creative landscape of London. The BarCamp London Planning Team are looking for sponsors to make the next London BarCamp possible. There are all sorts of expenses that we need covering, and without your help, BarCampLondon would be impossible. We have a range of sponsorship options to suit, and we are open to discussion if nothing here fits. Ideally, sponsors will be able to directly provide items such as t-shirts, walkie-talkies, food, rather than money, but we can discuss exactly how this will work. Micro Sponsor (£250) – only for new, small start ups, and individuals. Regular Sponsor (£500-£1,000) – sponsorship for anyone and everyone. Super Sponsor (£1,500+) – direct sponsorship of a meal or party (e.g. The Acme Party). If you think you may be interested in sponsoring BarCamp London or would like to discuss anything mentioned on this page (we are always open to discussion, we couldn’t do this without you! ), please feel free to contact Cristiano Betta any time.